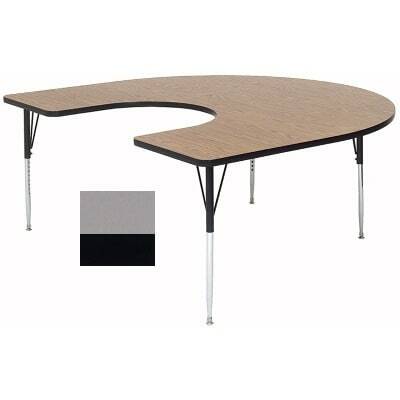 The Correll A6066-HOR 13 activity table is perfect for schools and churches with the horseshoe shape. With its dove gray color, this table blends in well with different design schemes. The 11⁄4-inch-thick, high-density particle board is covered by a high pressure laminate top that withstands heavy use. The top resists scratches, as well staining from food, juices, crayons, markers, and paint, better than melamine tabletops. The backer sheet on the Correll A6066-HOR 13 activity table is warp resistant, and the leg mounting system is strong for long-term use. Seven screws are used to attach the leg mounting brackets; three additional screws in the leg plate and an oversized hairpin brace make it more durable.